WrestleMen TV: Watch entire wrestling DVDs online too! Award-winning filmmaker, Victor Rook, spent over five years interviewing wrestlers from around the country, talking about everything from homoeroticism to the history of the underground and internet wrestling movement. This two-hour documentary, complete with an Extras disc of over one hour more featurettes and wrestling action, is a must have! More on film's official website. Men turn basements and motel rooms into makeshift wrestling sanctuaries. Guys demonstrate holds at wrestling events specifically for adult men. You asked for it, you got it. Included on this DVD are seven of the full-length matches shot for the film, STRONGHOLD: In the Grip of Wrestling. Watch these great guys show off their prowess in both submission and pro wrestling, and have a fun time doing so! See DVD cover. 65 min. Enjoy this new video of adult wrestlers competing in an open tournament. FIVE great matches, plus slow-motion recaps of the best parts after every match! See DVD cover. 38 min. Do you like scissors and sleepers? I mean, do you REALLY like SCISSORS and SLEEPERS! Then this is the package for you. Includes SCISSORCAMS I, SCISSORCAMS 2, and Wrestling in the Desert DVDs. Hours of head-throbbing, suffocatingly-tight PRESSURE and struggle. Check out the clips and pictures below and get it now, 'cause this special will only last a few weeks. The pressure is ON! All three DVDs: Turtle Trilogy, Turtle Take 2, and Turtle Heat Wave together in a discounted pak! If you like seeing guys doing UFC-style wrestling, lots of ground action, then this is the pak for you. Check out pics and more info below for the individual DVD titles. Watch five guys wrestle it out in the hot Phoenix summer heat. See them slip and slide in their own sweat! Featuring newcomers: Trinket, Chief Crazy, and Bulldog. Plus Turtle (Lance Jeffers) and Angel (who also appears in "Turtle Trilogy"). Great bodies, nice tattoos, great action! Watch Turtle (Lance Jeffers) take on Mike Durden, plus two more matches with four new guys (Gage vs. Daly and Clutter vs. Frenchie) in non-stop total submission wrestling matches. Plus, Turtle demonstrates two methods of applying the REAR NAKED CHOKE! Three great matches with the infamous Turtle (Lance Jeffers) will have you sweating on the floor by the time it's over. Enjoy his total submission matches with thick-muscled and tattooed Mario, smooth and muscled Angel, and the very strong Panther. If you like a lot of submission CHOKES and head and body SCISSOR combos, this one is for you! Two more hot muscular men enter my lair and take on my pythons in this hot hot sequel to the highly rated SCISSOR CAMS I video, and the pressure doesn't get much tighter! Smothering head scissors, rib-cracking body scissors, and even hot ankle scissors KO my opponent. A surprise rubber singlet ending will have you gasping for air! New video featuring three men that are lured into bone crushing thighs and are tortured endlessly in the pythonic embrace! Body scissors, head scissors, fig-4 TIGHT and smothering face-to-crotch. Watch them gasp for air as the sinewy quads constrict in sssslowly, over and over again. The lure of the legs clamping down tight! The ULTIMATE scissor experience! Watch one man suffer at the mercy of two other men in the seclusion of a desert resort. Non-stop punishment! SCISSORS, SLEEPERS, TORTURE RACKS, you name it! Featuring Doc Holliday, Txwrsslr, and newcomer Chris (BreakerThor)! Includes Victim #1 from the SCISSORCAMS I video! Deep in the endless mountain region of northern Pennsylvania, men from around the world meet up each year for some hot and sweaty man-to-man wrestling action. This video features TEN guys wrestling it out in the wilderness in great submission matches. The video features TONS of holds: SCISSORS, SLEEPERS, BEARHUGS, NELSONS, you name it! There's nothing more primal than men wrestling in the woods! While building a secret mat room hideaway, two men lock up to battle it out for ultimate supremacy! SCISSORS, SLEEPERS, NELSONS and grinding muscles strip them from pro gear down to their jocks for a night of non-stop MAT ROOM WRESTLING! 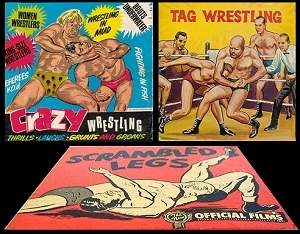 Watch ALL three of these digitally transferred rarely seen wrestling films. One with audio, two silent with great action! Approx. 26 min. 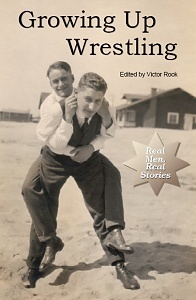 "Growing Up Wrestling" in Paperback, Kindle, and Nook. Paperback on Sale! Just $15.95! Order below. PayPal also accepts credit cards. "Growing Up Wrestling 2" in Paperback, Kindle, and Nook.